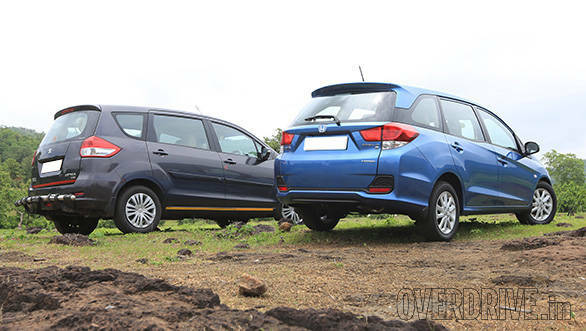 There are many MPVs out there in the market, more so in the sub-ten-lakh rupee bracket. But there is a new breed that has taken birth  MPVs that are based on small-car platforms, have small engines too, but still promise large space and a car-like driving feel. I like to call them 'crossover people-carriers'. The first vehicle to be born with such a form was the Maruti Suzuki Ertiga, which has become an instant hit, thanks to its low cost of ownership, healthy fuel economy and relatively good styling. 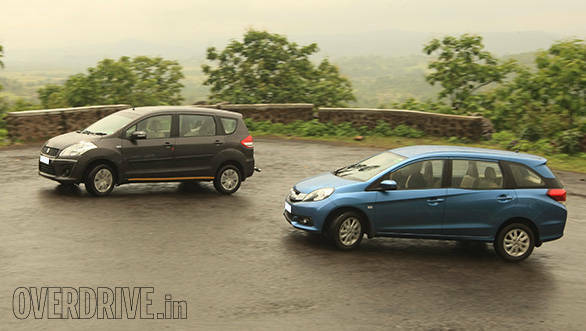 It now has a rival that claims to better the Ertiga on all these counts. Say hello to the Honda Mobilio. What comes across as a funky Amaze with a Mohawk, is actually Honda's first MPV for India. It's based on an extended Brio platform and the familial connection is visible  the same Pokemon-like face and multiple slashes on the doors. It has got a quirky lightning-bolt shaped shoulder-line that allows room enough for a large glasshouse. The money shot however is the Civic Tourer Concept-inspired floating C-pillar and the BMW X-Series inspired T-shaped taillights that primarily contribute towards making the Mobilio look stylish and upmarket. It isn't the prettiest car around though, but breaks away from the breadbox-shape stereotype of the other MPVs. The Ertiga on the other hand, doesn't. Its face tells you that it belongs to the same family as the Swift and the Ritz, but the rest of the bodywork appears too bland and boxy when it stands next to the Mobilio. The Honda clearly steals the thunder, as it looks more like a stylish station wagon than a boring people-carrier. That is also because the Mobilio is longer than the Ertiga and isn't as tall either. 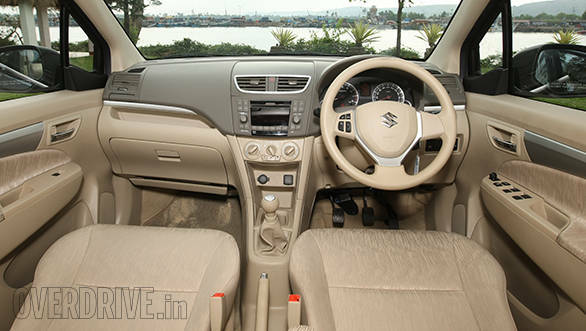 But because the Ertiga is based on the Swift's platform, it is wider. The math is simple  the Ertiga should have better space then. In terms of headroom and shoulder space, it is marginally better than the Mobilio. But the Mobilio gets better legroom than the Ertiga for both the second and the third row. The second row seats in both cars are adjustable for reach, but accessing the third row is easier in the Mobilio as its second-row seats have a simpler tumble-type fall. The Ertiga on the other hand requires you to slide and recline the seats all the way forward and crawl your way to the third row. The third row is cramped in both the cars though and is better left for kids. Both the cars place their fuel tank under the second row to maximise space. But since the third row sits on top of the rear wheels, there is hardly any space between the floorboard and the seats, meaning you sit as you would on a futon. But that said, the seats of the Ertiga have better cushioning than the Mobilio and should be more comfortable on longer distances. The integrated headrests on the Mobilio's front seats aren't comfortable and are bound to make you feel short-changed. Even the interiors are a bit of a let down on the Mobilio. The Brio dashboard looks a tad too basic for a stylish MPV. What makes it worse is the faux wood trim around the instrumentation. Sold as an accessory for the Brio and the Amaze, the trim seems to have done well at the dealerships and therefore, finds itself included in the top-spec Mobilio. The top spec version also gets a touchscreen infotainment system. An aftermarket fitment, the head unit plays video and has an in-built satellite navigation system as well. The Ertiga on the other hand gets a basic audio system that is compatible with USB and aux inputs, but the audio quality is nicer than what you get in the Mobilio. Both cars get a four-speaker setup. Unlike the Mobilio, the Ertiga audio unit is integrated into the dashboard. Essentially the same design as the Swift and the Dzire, the Ertiga beige plastics don't look as sporty as the Swift's all-black unit. Furthermore, unlike the Mobilio's dashboard, which gets a black top, the Ertiga light colours tend to reflect onto the windshield when driving with an overhead sun. The Ertiga comes with fabric upholstery across all the trim levels, whereas the Mobilio gets faux leather on the top-spec model. But the fabric upholstery on the mid-spec Mobilio variants looks and feels far better. Both cars get rear air-con vents with independent condensers and cooling coils. Neither gets climate control - which is surprising for the Ertiga, considering the Swift and the Dzire get it on their top-spec models. Both the cars have ample storage room too with plenty of bottle holders spread out all the way to the third row. But the Ertiga gets an edge, thanks to the presence of a cooled can-holder for the front passenger seat. In terms of ride quality, both the people carriers are at par. The Mobilio has a slightly softer ride and its marginally higher ground clearance gives it a slight edge when tackling potholes. Around the bends, it feels less wallowy too, thanks to its lower ride height. The Ertiga steering setup is better though. Like the Mobilio, the Ertiga's steering is light and convenient for city use, but returns better feedback. Both cars come with 185-section tyres and their grip was decent throughout our drive, which consisted of wet and dry patches. The Ertiga makes use of the common, Fiat-sourced 1.3-litre Multijet engine that is tuned to churn out 90PS of power and 200Nm of torque. 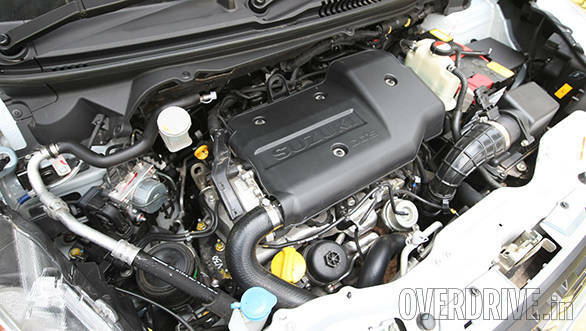 The Mobilio on the other hand uses the 1.5-litre i-DTEC oil-burner that produces 100PS and 200Nm. In all respects, it pips the Ertiga by being sprightlier and more involving to drive. Its displacement and torque advantage not only help the Mobilio perform better even with a full house, but also help it claim significantly better fuel economy. But since we haven't put the two cars through a rigorous road test, we won't be able to give you the real-world figures. Both the Multijet as well as the i-DTEC engines are known to be noisy operators, but the Ertiga has better sound insulation. 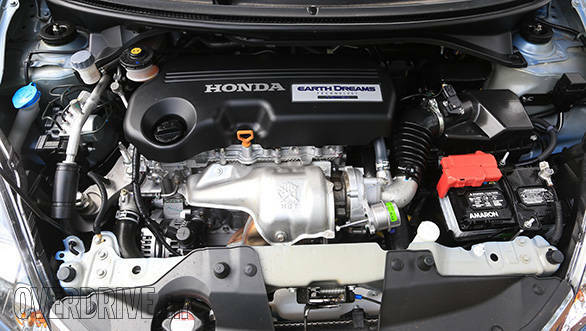 The engine refinement levels are at par, but the Ertiga gearbox feels a tad smoother. Out of the two, the Mobilio feels more car-like to drive. Both the cars make their length and rear-end weight evident, but the Mobilio feels like the easier one to drive. The Mobilio also feels a tad more stable at speed and under braking. Knowing Honda, we also expect the Mobilio to have airbags and anti-lock brakes as standard fitment across most of its variants, whereas the Ertiga only provides these on the top-end model. The Mobilio ticks most of the right boxes  it is stylish, drives really well and being based on the Brio platform, is frugal and will be priced competitively. 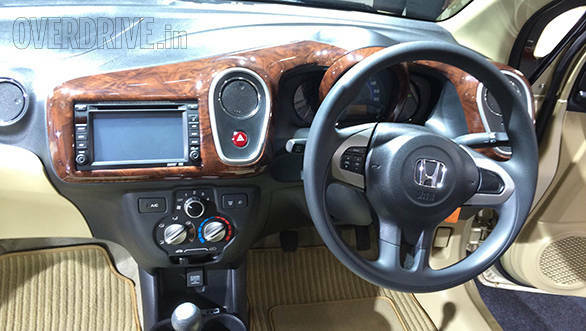 Its interiors are a notch or two lower than what its exteriors project and the quality and feel of plastics in most of the new Honda cars seems a tad low-rent as compared to those in their competition. But though it lacks the feel-good factor, it redeems itself with lots of room and a larger engine. The Ertiga on the other hand has started to look boring already, doesn't have significantly better interiors either and does lose the paper-war when it comes to down to the spec-sheet. Bearing the Maruti Suzuki badge and all the virtues that come with it, the Ertiga will continue to rule the compact-MPV segment that it has kick-started. 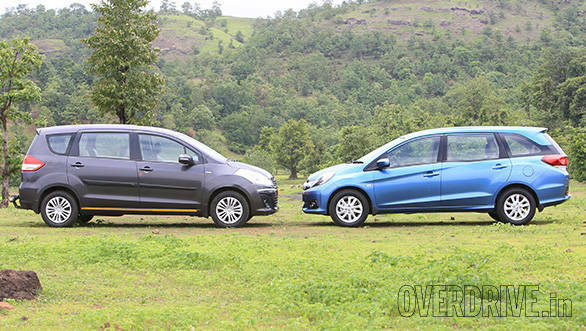 But unlike the rest of the competition, the Mobilio has the jaws to bite away a significant chunk from the Ertiga's share of the pie. 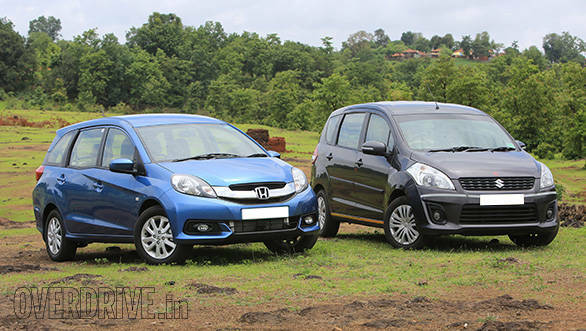 You can also check out our first drive impressions of the Honda Mobilio.